Q. Your shortest match of the tournament so far despite it being your most formidable opponent on paper. Safe to say that your best tennis is still yet to come? KEVIN ANDERSON: Yeah, I mean, just commenting on today’s match, it was definitely a great match today. I felt I played really well right from the beginning. I think I played some really good tennis the last couple matches, just not from the start. It’s sort of come sort of midway through the matches. So I knew it was important to try and start off that way, you know, as quickly as possible. And, you know, right from the first point till the last, I felt I was in a really good frame of mind, playing the kind of tennis that I knew I wanted to be playing and needed to be playing. I thought I executed really well. And, of course, getting off the court, you know, pretty comfortably definitely is a really good feeling. Q. How important was that break point to start off the second set? KEVIN ANDERSON: Yeah, always after having a good first set, it’s always nice to continue that momentum to the second set. Starting off like that, I think, was really important for me. And then backing up with my serve the next few games really, you know, put me in a really good position. And of course getting the second break, you know, made it a little bit more comfortable serving out the match. Q. And you didn’t get broken in that match and 12 aces as well. What was your approach going up to that service line? KEVIN ANDERSON: Yeah, just the same as I always approach, you know, going through my routines and my rituals. And I felt really good on the serve today. I didn’t have to face any break points, so that’s always a positive. But just the main thing, the same approach. And, you know, today was a day that definitely, you know, it came off the racket nicely. Q. Having some of the success that you’ve had in sort of the later stages of your career getting to the Grand Slam finals, does it mean more to you that you’ve done it later? Like, is it more meaningful at all? Do you appreciate it more just because it’s happened a little bit later? KEVIN ANDERSON: It’s tough to say. I just know how it feels right now. And as I said, it’s definitely a long way to get here. But I’m really excited about the way I’m playing. I’m incredibly motivated to keep working hard, keep pushing myself. I know that there’s a lot of, you know, goals that I set for myself that I haven’t achieved yet. I feel like I’ve done a good job through my career of looking ahead and staying motivated, always believing that I can do better. And I think it’s been that sort of motivation that’s kept me going and why I’m sitting here, 32, and still feel like I’m playing some of my best tennis. I still, you know, see areas in my game I can improve. So as long as I can stay healthy and keep that excitement going, I think that’s obviously two important aspects for me. Q. I don’t think you have the best memories of last time you played here. Just wondering if you remember that match and how you think you have evolved as a player since then? KEVIN ANDERSON: Yeah, definitely remember that match. It was a heartbreaker, losing six in the third after having match point, serving for it. So I was definitely motivated to go out there and try and get the better of him. That match was a few years ago so, you know, it doesn’t have too much of an influence other than, you know, it’s definitely feeling really excited at the opportunity of trying to take a step further. Not just beating him, but also getting through to the semifinals here for the first time. Q. Getting back to the age factor again and being 32 and where you are now, are you seeing more of a threat from the younger group of tennis players in the game now? We see quite a few younger kids doing well here this week. KEVIN ANDERSON: Yeah, definitely in the last few years I think you have seen a whole emergence of younger players, and I think that’s really exciting. This sport definitely needs it. The whole NextGen initiative has been really, really amazing. 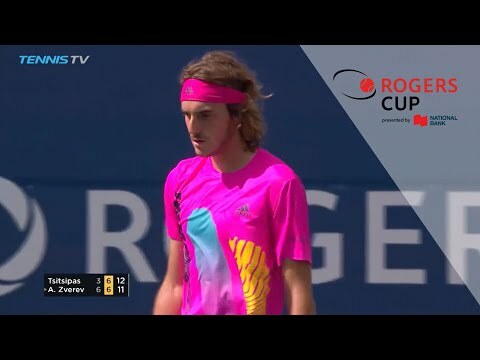 Just watching the two guy right now, Zverev and Tsitsipas, two of the sports brightest stars. I mean, there’s a whole bunch of them. It’s, you know, a really interesting contrast between guys playing well into their 30s and sort of the new group of guys. You know, not as young as maybe the Federers and Nadals were when they had their amazing success winning Grand Slams, but I think it’s a little bit different in terms of who is still playing. But there’s definitely a lot of very tough, you know, younger players coming through. Q. Was there ever a moment in the last year or so where you felt like a switch kind of flipped for you where you figured something out? Was there a tactical tweak kind of coming from where you came from and having the injuries and at this point in your career to be having this kind of sustained success, did it just come about organically as the product of hard work? KEVIN ANDERSON: No, I don’t think there was one sort of flick of a switch. It really feels like there was systematic improvements in many different areas. And, you know, I feel like I’ve always been looking at ways to improve different parts of my game, and I think I’ve been able to continue to do that. Staying healthy obviously is really important. I feel like certain adjustments in the way I’m playing tennis, certain mental adjustments too. You know, and as I’ve gone along, I’ve been able to trust myself more and more. You know, some of the results I’ve had definitely makes that process a lot easier. So it’s tough to sort of point it out. It wasn’t sort of one moment where it all came together. I feel like there was a lot of little moments along the way. I mean, of course I can point to some of the bigger ones, making two Grand Slam finals now. Those are — you can gain a lot of confidence and belief in those sort of results. But on a day-to-day level, it’s more really trusting the process. Q. On the analytic side, it seems like your return is the biggest improvement. Would you agree with that? KEVIN ANDERSON: Yeah, that’s something I’ve been working really hard on. I’ve always felt really comfortable on the return side. It’s also figuring out the puzzle of how to be more effective actually in the matches, in the points. You know, even in previous years, I feel like especially going out in the doubles court sometimes, feeling, you know, really comfortable on the return side. So it’s something I worked very hard for a really long time on. I feel there’s still some improvements to go there. Of course if I can, you know, break as much as some of the top guys break and if I can serve the way I do, that would obviously be ideal. But of course I feel like I’m making some good steps in that category too. Q. We all know that you guys play every match as it is, you walk out there trying to win. But I think it took you 11 tries to get through a Masters 1000 quarterfinal. Do you feel a mental change for you once you’re able to do that, or when you’re in a Masters event do you feel like you expect yourself now to be in say the final eight, final four every time? KEVIN ANDERSON: Yeah, I think definitely for me it’s been a bit of a case of trying to make that breakthrough. And as I’ve done that, I think I’ve gained more belief and trust in my game. I’m actually seeing the tangible results as opposed to maybe some guys who haven’t achieved it before and then have suddenly done it and have found a way. I feel like I’ve been a bit more systematic, taking steps forward over a long period of time. Obviously I was able to make a few bigger leaps in making a couple Grand Slam finals now. But that’s something we’ve been looking at, running out of time to make too many small improvements. You’ve got to also take a bit of a bigger step forward. And, you know, I feel like coming into this year that was one of my primary goals and actually even halfway through last year as well. So I’ve been able to climb a few more rungs of the ladder instead of taking sort of one, you know, step at a time.